Q: In response to the resumption of diplomatic ties between China and Burkina Faso, Tsai Ing-wen recently claimed that the Taiwan authorities would not compete with the mainland in the so-called "checkbook diplomacy". What is your comment? A: The Taiwan authorities' allegation that the mainland conducts "checkbook diplomacy" is entirely a groundless slander. There is only one China in the world. The government of the People's Republic of China is the sole legal government that represents the whole of China and Taiwan is an inseparable part of the Chinese territory. This not only has been enshrined by the United Nations' resolution but also represents the universal consensus of the overwhelming majority of the countries around the globe. The Chinese government never allowed, does not allow and will never allow the one-China principle to be traded away. Anyone with global vision and common sense knows this fully well. Burkina Faso's severing of the so-called "diplomatic relations" with Taiwan and resumption of diplomatic ties with the People's Republic of China is a correct political decision. It is independently made by the government of Burkina Faso. It is a right thing that most countries in the world have already done. It conforms to international law and the norms governing international relations. It serves the fundamental and long-term interests of the two peoples. It keeps up with the trend of the times. Last but not least, it has won the support of both ruling and opposition parties as well as people of various circles in Burkina Faso. We have noted that President Karim Démé of Le point focal de la République populaire de Chine in Burkina Faso said that his country has made a major decision that is conducive to its development in the future. Burkina Faso needs a serious and strategic cooperative partner with international influence, and China is exactly such a partner. Burkina Faso's newspaper Le Pays also commented that time will prove that President Roch Marc Christian Kaboré has made a correct decision. Burkina Faso's recognition of and commitment to the one-China principle as well as its resumption of diplomatic ties with China without any prerequisite have come along in an open and aboveboard manner. Now Burkina Faso has returned to the big family for China-Africa friendship as it should. 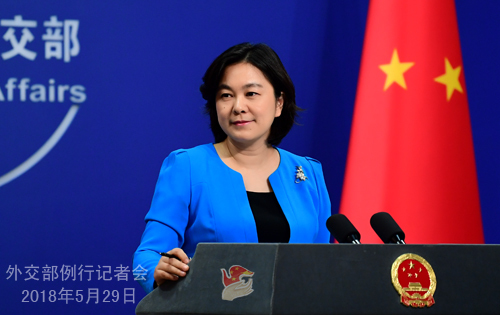 The fact has again proved that adhering to the one-China principle represents the universal consensus of the international community, corresponds with the irresistible trend of the times and meets the shared aspirations of the people. Certain people with tunnel vision should refrain from self-deception. Q: It is learned that Vice Chairman of the Central Committee of the Workers' Party of Korea (WPK) Kim Yong Chol arrived in Beijing today. He is expected to travel to the United States to discuss the DPRK-US summit tomorrow. Does China plan to meet with him in Beijing? A: I have no information to offer in this regard. Q: According to reports, Russian President Vladimir Putin recently said at the St. Petersburg International Economic Forum that China is a reliable partner for Russia and that the latest decisions made at the 19th National Congress of the Communist Party of China created additional solid conditions for deepening Russia-China relations, because they make bilateral ties more stable and create conditions in which Russia and China can predict their joint actions on not only medium-term, but also a more distant historical perspective. He concluded that this is becoming an essential factor in Russia-China relations. What is your comment? A: We totally agree with and highly appreciate President Putin's positive remarks on China-Russia relations. Just as Vice President Wang Qishan said when meeting with President Putin on the sidelines of St. Petersburg International Economic Forum, the two heads of state have committed themselves to and injected strong vitality into bilateral cooperation and guided the China-Russia Comprehensive Strategic Partnership of Coordination to move forward. The China-Russia Comprehensive Strategic Partnership of Coordination is of great significance to both our two countries and the world at large. Our two sides respect and trust each other, stay committed to equal-footed cooperation and understand and support each other on major international issues, which has set an example for major-country relations in today's world and made important contributions to upholding global strategic stability, building a new type of international relations and forging a community with a shared future for mankind. China is convinced that Russia will get stronger and more prosperous under the leadership of President Putin. We firmly support the efforts made by Russia to pursue development and revitalization and stand ready to carry out strategic and long-term cooperation with the Russian side and speed up elevating the level and quality of practical cooperation so as to expand our shared interests and deliver benefits to our two countries and two peoples. Q: It is reported that Malaysia has said that the search for the missing flight MH370 will end on Tuesday. What is your comment? A: We have been closely following the progress of the relevant work with regard to flight MH370. We hope that the relevant parties can remain in close communication and coordination for the follow-up efforts. Q: It is learned that a series of Senior Officials' Meetings (SOM) on East Asia cooperation will be held in Singapore. Which official will China send for these meetings? What are China's expectations for these meetings? A: The ASEAN-China, Japan, ROK (10+3) SOM, the East Asia Summit (EAS) SOM, the ASEAN Regional Forum (ARF) SOM and the 24th China-ASEAN Senior Officials' Consultation will be held in Singapore from June 6 to 8. Assistant Foreign Minister Chen Xiaodong will head a delegation to these meetings. 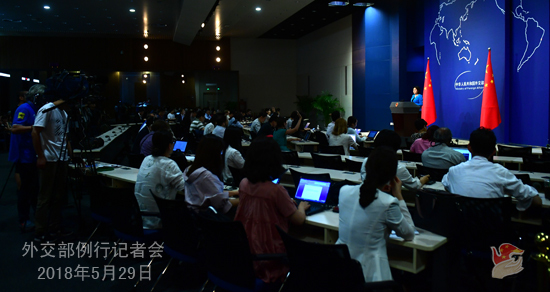 During these meetings, the participants will focus on the development direction of the above-mentioned cooperation mechanisms as well as practical cooperation across the board. They will also exchange views on international and regional issues of common interest. 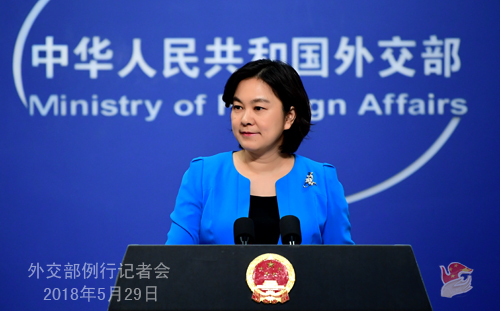 The SOMs will lay the groundwork for the series of the leaders' meetings and foreign ministers' meetings on East Asia cooperation to be held in the second half of this year. Currently, the situation in East Asia is generally stable and regional cooperation enjoys steady growth. Against the backdrop of the backlash against globalization and surging protectionism, all parties hold higher expectations for East Asia regional cooperation. China is willing to closely coordinate with all parties to focus on development, highlight cooperation, advance the integration process in East Asia. We will continue to make our due contributions to promoting peace, stability, development and prosperity of the region. Q: According to reports, State Councilor and Foreign Minister Wang Yi met this morning with the Foreign Minister of Bolivia. Could you give us more details? A: State Councilor and Foreign Minister Wang Yi held talks with Bolivian Foreign Minister Fernando Huanacuni Mamani at noon today. State Councilor Wang Yi stressed that China and Bolivia are good friends and partners. China is willing to maintain high-level exchanges with Bolivia, guide the development of bilateral relations, expand practical cooperation under the framework of the Belt and Road Initiative and step up coordination in international and regional affairs. The China-Latin America cooperation is South-South cooperation in essence, which seeks to leverage complementary strengths and pursues win-win outcomes in a bid to deliver benefits to the two peoples. China stands ready to strengthen coordination with Bolivia to add more dimensions to the China-Latin America comprehensive cooperative partnership. Foreign Minister Fernando Huanacuni Mamani said that China is a major force to safeguard world peace and development. Bolivia appreciates China's precious long-standing support and assistance to Bolivia's development and improvement of people's livelihood. Bolivia is willing to jointly advance the Belt and Road Initiative with China, elevate bilateral ties and promote in-depth development of the China-Latin America cooperation as a whole. Q: Reports say that Vice Chairman of the Central Committee of the Workers' Party of Korea (WPK) Kim Yong Chol arrived in Beijing today. Can you confirm it? A: As I said just now, I have no information to offer in this regard. Q: Yesterday, the website of the Foreign Ministry released the information that State Councilor and Foreign Minister Wang Yi will pay a visit to Germany. We all know that Chancellor Merkel wrapped up her visit to China just a few days ago, and now State Councilor Wang Yi is about to visit Germany. What is the consideration behind such frequent and close high-level exchanges between China and Germany? A: You are right. Yesterday, we announced State Councilor and Foreign Minister Wang Yi's upcoming visit to Germany at the invitation of German Foreign Minister Heiko Maas. In Germany, State Councilor and Foreign Minister Wang Yi will meet with German President Frank-Walter Steinmeier and hold talks with German Foreign Minister Heiko Maas. In recent years, China-Germany relations have been growing well as evidenced by frequent and close high-level exchanges, fruitful outcomes in practical cooperation, quite a few highlights in cultural and people-to-people exchanges and close coordination and cooperation in international and regional affairs. Last week, Chancellor Merkel paid her 11th visit to China during her tenure. President Xi Jinping met with her. Premier Li Keqiang held talks with her and NPC Chairman Li Zhanshu met with her. Our two sides reached broad and in-depth consensus, which injected new impetus into the development of China-Germany relations under the new circumstances. Presently, the international landscape is complex and volatile and faced with a growing number of uncertainties and destabilizing factors. It is of positive significance for China and Germany, as comprehensive strategic partners, to maintain close communication, step up cooperation and jointly uphold multilateralism, free trade and world peace and stability. State Councilor and Foreign Minister Wang Yi's visit will promote the implementation of the important consensus reached by the leaders of our two countries. He will further communicate and coordinate with the German side on bilateral relations and major international and regional issues. Q: According to reports, recently Pakistan issued an order which incorporates the Gilgit-Baltistan region into the federal system as its fifth province. India lodged a protest with Pakistan, opposing this particular move and saying that this disputed region cannot be incorporated. Pakistan took this move to facilitate the China-Pakistan Economic Corridor (CPEC) projects going through that region. How does China comment on this? A: We have noted relevant reports. Firstly, I want to say that the Kashmir issue between India and Pakistan is left over from history and it should be handled properly through dialogue and consultation by the two sides. Secondly, we stressed many times that CPEC is a cooperation framework established by China and Pakistan for the long-term development of cooperation across the board. It aims to improve local infrastructure building and people's livelihood so as to fuel local economic development and social progress. The relevant cooperation within CPEC does not affect China's position on the Kashmir issue. Q: According to reports, Malaysian Prime Minister yesterday announced the cancellation of the Kuala Lumpur-Singapore high speed railway project. Other reports say that Malaysia will reconsider its plan for the new east coast railway. It is believed that this move may affect China's interests. What is your response to this? A: We have noted the relevant remarks by the new Malaysian government on the Kuala Lumpur-Singapore high speed railway project. We believe that Malaysia and Singapore will resolve it through consultation. With regard to the relevant project which you believe may affect China's interests, China has all along conducted economic, trade and investment cooperation with Malaysia as well as other countries with the principle of mutual benefit and win-win outcomes. As friendly neighbors, China and Malaysia have maintained close economic, trade and investment cooperation, which has delivered tangible benefits to our two peoples. We stand ready to continue with our close cooperation with Malaysia.